The rugged range of hills which can be seen to the north of here is among the oldest visible physical features on the earth. The hard quartzite rock that forms them was deposited as sand in a shallow sea which once covered this region. Although deposited horizontally, the layers were warped until they were tilted fifteen degrees at Devils Lake and vertically at Rock Springs. The gorges which may be seen at these places were eroded by rivers millions of years ago. 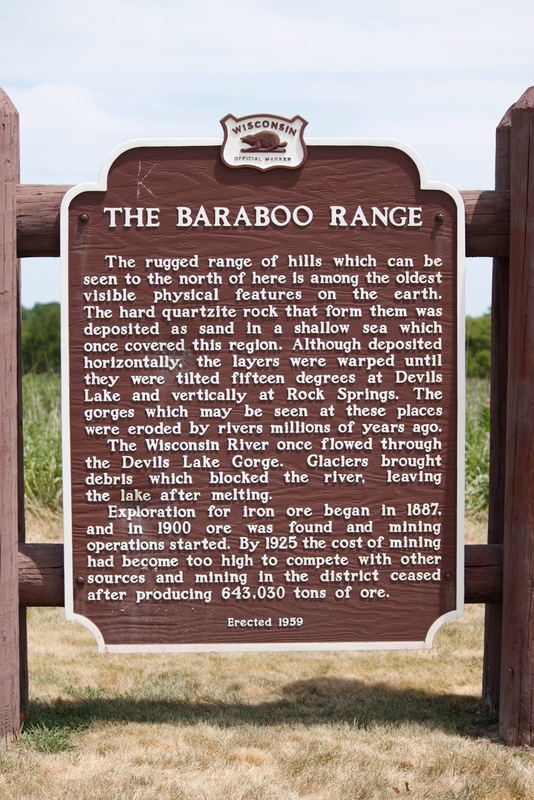 The Wisconsin River once flowed through the Devils Lake Gorge. Glaciers brought debris which blocked the river, leaving the lake after melting. Exploration for iron ore began in 1887, and in 1900 ore was found and mining operations started. By 1925 the cost of mining had become too high to compete with other sources and mining in the district ceased after producing 643,030 tons of ore. 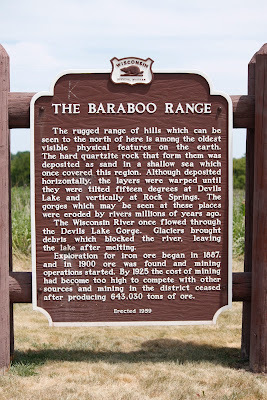 The marker is located at a pull-off on U.S. 12, between Prairie Road and Waterbury Road, Prairie du Sac, Wisconsin 53578. NOTE: This is one of the first markers I visited, and did not know at that time that this website would be created; thus, only this photo of the marker was taken. I hope to return another time to take more photographs of this location.